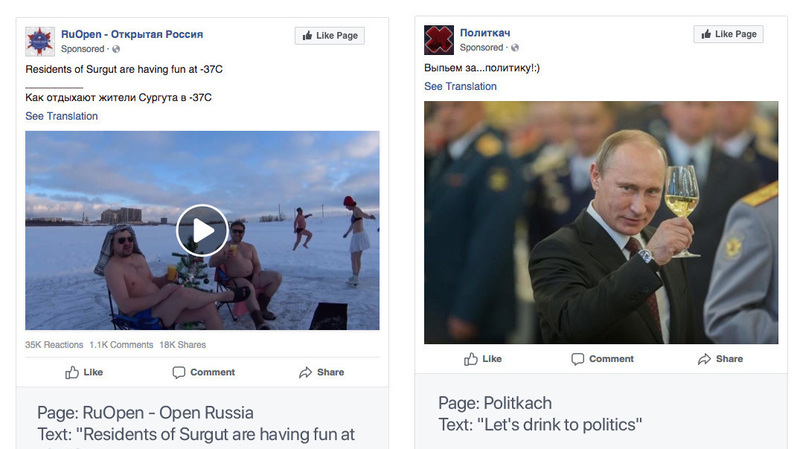 Kremlin Calls Facebook's Removal Of Russian Pages And Ads Censorship : The Two-Way Facebook is targeting the Russia-based Internet Research Agency — the "troll factory" that is under indictment for interfering in the 2016 U.S. election. Facebook says it took down more than 200 pages and accounts that were linked to a Russian "troll farm," the Internet Research Agency. Here, ads associated with some of the pages are reproduced. The Kremlin is crying foul on Facebook, accusing the social media giant of censorship after it took down more than 200 pages and accounts that were run by the Russia-based Internet Research Agency — the "troll factory" that is under indictment for interfering in the 2016 U.S. election. When it took down the pages this week, the American company said, "The [Internet Research Agency] has no place on Facebook." The company removed 70 Facebook accounts and 138 pages, along with 65 Instagram accounts and a number of ads. Most of the removed material was in Russian and included commentary on domestic and international events. On Thursday, Facebook's move came up during a briefing by Russian President Vladimir Putin's spokesman, Dmitry Peskov, who was asked whether the U.S. company had gone too far. "Yes, it is [a manifestation of censorship toward Russian mass media]," Peskov said, quoted by state-run Tass media. Facebook's move also snared the Russian Federal News Agency, as NPR's Lucian Kim reports from Moscow. "On Wednesday, Russia's Federal News Agency said its pages had been taken down by Facebook and Instagram for no reason," Lucian said. "The Federal News Agency is linked to businessman Yevgeny Prigozhin, who has been indicted by a [U.S.] federal grand jury for interfering in the 2016 U.S. election." It's not the first time the Federal News Agency has been targeted by a U.S. company. Last October, Google dropped the outlet from its news feed and reportedly stopped indexing it for news search purposes, but then Google restored the outlet after an inquiry from Russia's official telecommunications regulator, Roskomnadzor. Facebook said its removal of Russian accounts and ads was not tied to any specific piece of content. "The IRA has repeatedly used complex networks of inauthentic accounts to deceive and manipulate people who use Facebook, including before, during and after the 2016 U.S. presidential elections," Facebook said in a notice, using the Internet Research Agency's initials. "It's why we don't want them on Facebook. We removed this latest set of Pages and accounts solely because they were controlled by the IRA — not based on the content." Speaking to the media on Thursday, Peskov also took exception to a question about whether Russian oligarchs have been in touch with the Kremlin and Putin about increased levels of scrutiny from U.S. agencies. A better term would be "representatives of big business," Peskov said, according to Tass. The Putin spokesman added that he had no knowledge of what wealthy businesspeople might be saying about potential investigations by American law enforcement.